Full disclosure since it would have been too confusing in the title. I am currently stationed at a shore support command for submarines. I have been stationed aboard 3 nuclear subs. I will rotating back to see duty this summer. https://imgur.com/gallery/HCrD8 for proof. Can provide more is needed and practical. Gotta run - thanks for all the questions! Hey All! I’m Jessie, a Cross Country Skier and I race all winter on the World Cup - I am gearing up for another Winter Olympic Games -- all races from sprints to 30 kilometers! I have 4 World Championship medals, was part of the 2014 Winter Olympic team and am gearing up for another Olympic games. Learn more about me and all Olympic hopefuls at teamusa.org. The Winter Games begin Feb 8 on NBC! 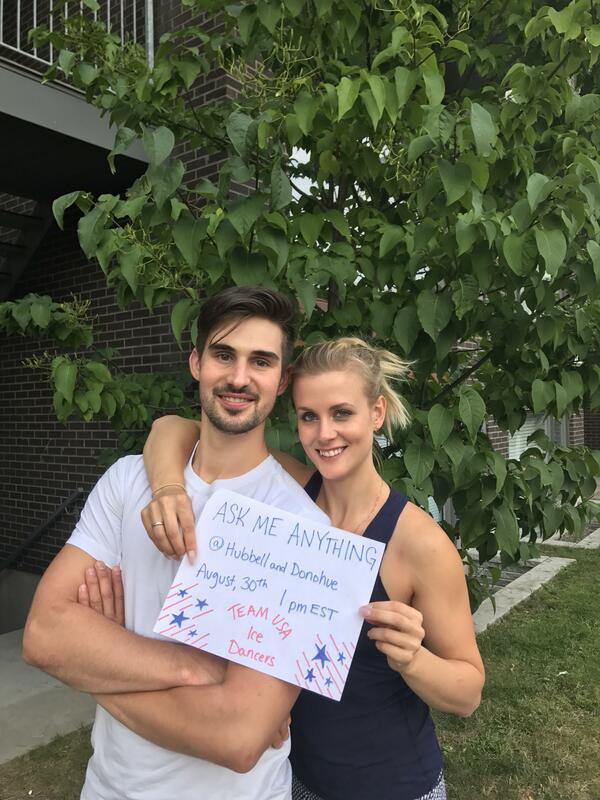 Read all Olympic AMA's and see what's next on Reddit at reddit.com/user/TeamUSAOlympics. Subscribe now to Ask Them Anything! My short bio: I'm Helena Oliviero, a features reporter with The Atlanta Journal-Constitution since 2002. I cover lifestyle and human interest stories. For this AMA, I'll be joined by Atlanta employment lawyer Amanda Farahany (http://justiceatwork.com/our-people/amanda-a-farahany-2/) to answer questions about sexual harassment in the work place. We'll start answering questions around 4:30 p.m. today! ******UPDATE***** Here is the Facebook live answering some of the great questions you folks asked: https://www.facebook.com/myajcatl/videos/1701942433163877/ Expect a full story this weekend. Thank you to all the Redditors for great questions! I hope everyone enjoyed the AMA -- I had a great time! Looking forward to WIHS next week. I hope that many of you can make it! I am a 24 year old show jumper competing in the jumpers at WIHS (www.wihs.org). I came to WIHS for the first time in 2003 with my small pony First Edition and have looked forward to competing in the nation's capital almost every year since! This year, I will be bringing my horses Dougie Douglas ("Dougie") and Tarioso Manciais ("Harry"). I am excited for the whole week -- especially the costume class on Friday and the Grand Prix on Saturday! I ride full-time now after graduating from Harvard in 2016. 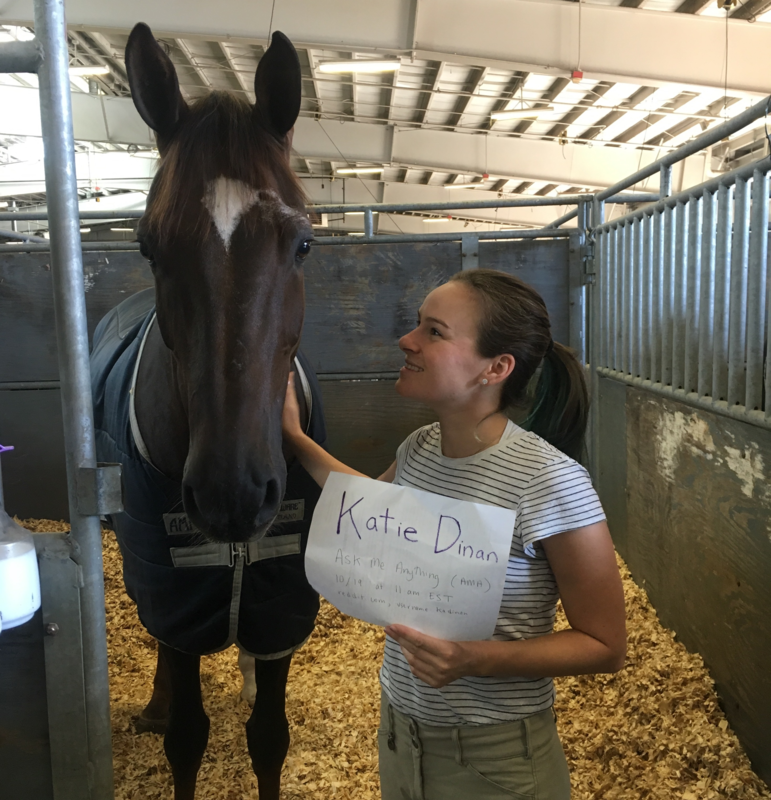 You can follow me on instagram (@katie_dinan) or if you are at WIHS, spot me by my blue hair (I dyed it earlier this year!). AMA! 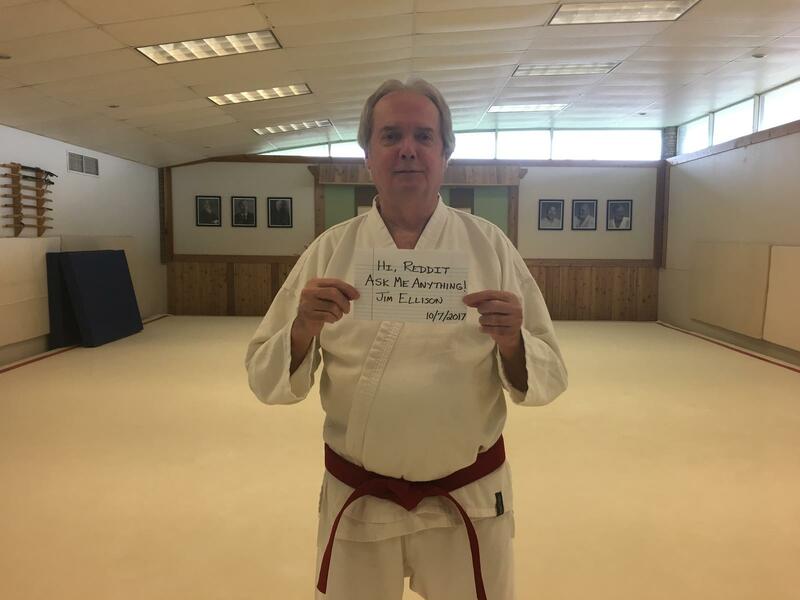 My short bio: I began practicing aikido in 1979, at the age of 33, and have been teaching it since the mid-1980s. Our dojo teaches a Tomiki style of aikido and is part of the Kaze Uta Budo Kai organization. I recently turned 70, and continue to teach classes a few times a week. Aikido is still a central aspect of my life. In addition to practicing and teaching aikido, I also write a blog called Spiritual Gravity. In addition to aikido, I've been interested in spiritual things most of my life, and this blog combines my two interests. There are plenty of aikido drills and advice on techniques, etc. There are also some articles on spirituality as it relates to aikido and life. I'm here to answer any questions you may have about aikido, teaching, spirituality, or life in general. Ask me anything! Edit: Signing off now. Thank you all so much for all the great questions. I will answer a few more later as time permits. My name is Sean Stratton I am a 24 year old environmental scientist and I am currently running for New Jersey District 18 Assembly as the Green Party candidate. I’m here to talk to you about my political platform and the experience of running as a young adult and third party candidate. I decided to run for office 5 months ago after a friend’s tap water test came back containing 82 ppb of lead. This led me to research the federal Lead and Copper Rule along with conducting Open Public Record Act requests (for anyone not in New Jersey this is called Freedom of Information) to my hometown and the New Jersey Department of Environmental Protection. What I found was that my hometown was not sampling the correct locations as per the federal regulations and they were not providing the correct notification to residents who had their homes tested. From this I began to look at other towns and found that we have multiple towns and cities here in New Jersey that have breached the federal action level for lead in residential drinking water. 3 examples are Newark, Trenton, and Milltown. This is significant because even during the height of the Flint Michigan crisis, Flint never exceeded federal standards. This is when I decided I would run for office; I believe that everyone has the right to clean drinking water and in order to provide this we need to drastically rebuild our infrastructure including our water distribution system. I also believe that every worker deserves a livable wage which is why I support increasing the minimum wage to $15 per hour here in New Jersey. Finally, I believe that all citizens no matter how rich or how poor have the right to healthcare. I support universal healthcare and will push for a New Jersey single payer healthcare system. EDIT: Wow! 7 hours and I definitely got way more questions than anticipated! Was great talking with everyone and I definitely learned a lot! Remember to vote in your state and local elections, they're important! Hey everyone I am sorry that I didn't get to answer all of your questions but I need to get back to training and building my sled for the upcoming year. I leave Wednesday for Germany and will be on ice in less than 2 weeks!!! 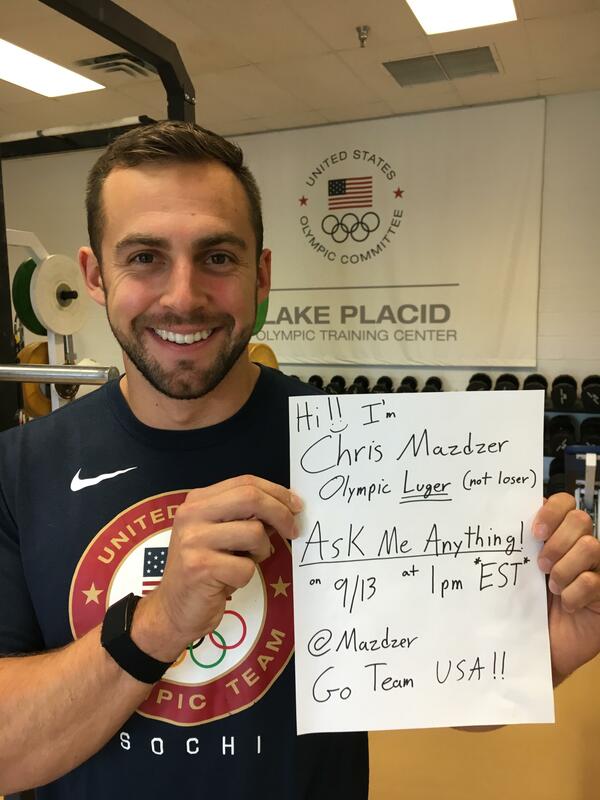 If you want to follow my story and abnormal life follow me on Instagram @mazdzer and @mazdzer for everything else. It was a made up name in the early 1900's and since their are just a few of us I have the digital market on it!!! I really appreciate all of your questions and everyone joining me on this thread, Thank you so much!!!!!! I go by Chris and my last name is pronounced “Mazder”, that second Z is to throw off telemarketers. I’m a 2x Olympian and 7x National Champion in the sport of luge for Team USA (basically ultimate sledding). I grew up in lake Placid, NY but over the past couple years I find that I Live out of my suitcase, which changes locations about every two weeks. I have been lugeing “not losing” since I was 8 years old and am currently training to be the fastest man on ice who wears a full spandex suit, and yes… its tight in all the wrong places. I like to think of myself as a connoisseur of a good time (thank god for auto correct) and enjoy pushing the limits of life. Its important to build the best you and always sleigh the day! AMA!!! My Bio: My husband and I met working at a mental health group home for the deaf and hard of hearing. We are considered CODAs (Child of Deaf Adult) in the deaf world which meant that we are hearing children raised by deaf parents and fluent in sign language. Fast forward 6 years to the day our son Elijah was introduced to the world. We expected him to pass his newborn hearing screening just like all of our nieces, nephews and older sister before him... but he didn't pass. We were stunned and heartbroken, yes heartbroken. You would think that this news wouldn't be so bad for a couple who were raised by deaf parents but it wasn't that simple. We have first hand seen the struggles our parents faced with in unemployment, communication barriers and the fight for education standards among the deaf children. Don't get me wrong...I take pride in my parents and my unusual upbringing. The thought of my son facing those barriers was too much for my heart to bare. We initially ruled out cochlear implants as an option because we grew up thinking that it didn't work very well and the sound quality was sub par. Not to mention, we were also well aware of the strong opposition to cochlear implants, especially on children. It didn't take long for us to learn that there was a lot of misconceptions about cochlear implants within the deaf community. We ultimately made the decision to pursue cochlear implants after doing endless hours of research and talking to other families. We announced announced to our family and friends that we would be exploring cochlear implants for our infant son. That sparked a lot of anger within our family. Half of our family members did not speak to us for about 6 months. Two of my husbands siblings have deaf spouses and our news caused a firestorm on his side of the family. My son was implanted at 9 months old and activated at 10 months old. Our family members ended up working through their differences with us after my son received his surgery. They chose to put aside their difference for the sake of Elijahs happiness. I think Elijah has definitely changed a lot of lives with his journey. Elijah is 2 1/2 now and he is doing amazing with his implants. He's has a fairly large vocabulary in spoken English and ASL. I still get anxious when deaf strangers see us out in public with our son. There are a lot of neutral/supportive Deaf folks out there but not very many are forthcoming about their support. My parents seem to be skeptical (but are supportive) about how well it works. They cannot hear him speak and so they tend to assume he's unable to hear speech. One interesting piece worth mentioning is that my sons hearing aid video went viral a couple years ago. That's a whole other can of worms we opened in the deaf community. Hey guys! We have to run back to the ice! Thank you so much for your questions, it was great to chat with you all! We will be logging on throughout the week to get to any questions we missed, so feel free to keep posting! I came to America at 22 with nothing - lived in the back of my van - and pitched my way into HSN with zero experience. Since then, I’ve sold more than a billion in products, had my own show on Discovery Channel, and started a successful production company. Now, I’ve written a book that teaches others how they can learn to pitch, so you can take control of your life and find success like I did. 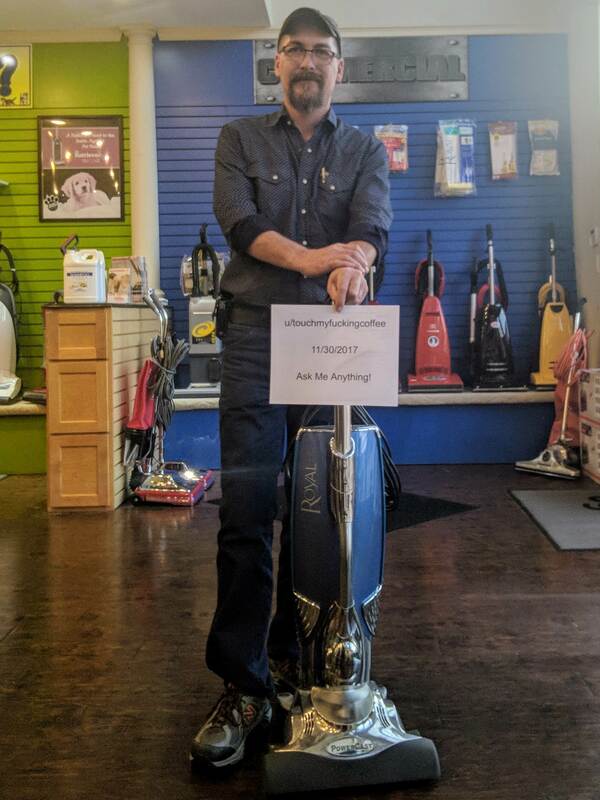 *my life’s journey *working with Billy Mays *what really happens behind the scenes of infomercials *having my own TV show *running a production company *Anything pitching! Like how mastering the skill of the pitch can change your life. *Anything at all! This is an AMA! 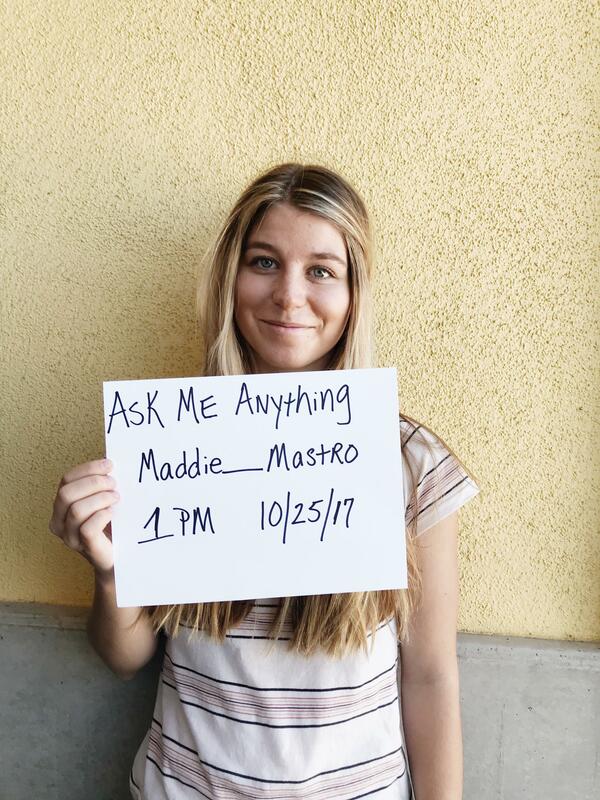 EDIT: Thanks so much for all your questions! I've gotta run to a shoot, but I'll get back on later to answer some more. You guys rock. That's all the time I have for today. Thanks everyone! I’m a 5 time Grammy-nominated guitarist with six #1 blues albums to my name along with a string of #1 mainstream rock singles and numerous awards. My new album Lay It On Down just came out last week - buy it at Amazon - and I’ll be on tour throughout the summer/fall.